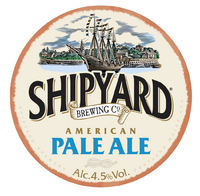 If you've been in a Marston's pub* lately, you may well have seen a keg font offering a rather nice American-style Pale Ale from Shipyard Brewing Co of Portland, Maine, in the US. You might even have thought it was an American import, but it's not – it is brewed by Marston's to a recipe that Shipyard devised specifically to suit British tastes. And in a coals to Newcastle twist, that same beer is now being brewed by Shipyard too in the US – a British version of an American beer style, brewed for the American market. The tale, as told to me by Marston's brewmaster Simon Yates (apologies to him for any bits I've misremembered! ), started in the 1980s with brewer Alan Pugsley working at Peter Austin's Ringwood Brewery, now owned of course by Marston's. Alan moved to the US to build breweries, and then in 1994 opened his own – Shipyard. Hankering after the British ales he'd helped brew, he asked to brew one of them under licence for the US market, namely Ringwood's Old Thumper. In return came Ringwood's Boondoggle summer ale, "originally brewed at Shipyard while visiting," says Simon. Fast forward a few years to 2012, and the relationship between Shipyard and Ringwood/Marston's continues, with Alan visiting to brew a guest cask beer at Ringwood, called Shipyard Independence Pale Ale. It had a big citrus nose, and was dry-hopped with Chinook, Cascade, Columbus and Centennial, all of them American. This was pretty popular as a guest, and it had become obvious that there's a good market for American-style Pale Ales and IPAs in the UK, so Simon and the Marston's crew asked Alan to help them create a suitable keg beer too. "The Pale Ale was a mash-up between Shipyard and Marston's," explains Simon. They tweaked Independence and did test brews, one was chosen, and it launched on keg as Shipyard American Pale Ale in May 2013, still with those same four American C-hops. The Shipyard guys never planned to brew it in the US – the recipe was created for Britain. But then session beers (which for the US means about 4.5% alcohol or less!) took off there, so they took the Marston's recipe and brewed it themselves. It launched there last year, and is now causing confusion right across the beer ticking world, with drinkers unable to work out which one they're drinking. What jolly fun, eh? *Or even some Wetherspoons - I saw it last week in the White Swan, Highbury Corner.